MANAGE YOUR SOCCER TEAM TO SUPERSTARDOM! The newest member of the 'Superstars' franchise! Guide your team to world success in Season Mode, bring home a trophy in Cup Mode, or relive memorable international soccer moments in Dramatic Mode! 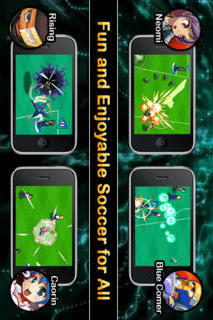 "Soccer Superstars is an excellent pick. You still have real soccer play, but between the RPG elements and the super-players, there’s enough 'videogame stuff' to deliver fun escapism." "Football title with the emphasis very much on the cartoony and extravagant, with explosions leaping from boots and cutaways of your players in the style of an anime battle sequence." "You will lose entire afternoons to playing series of games to improve your customized teams and players." "The game will be a addictive game that should turn out to be a must buy." 1 Cup, My League and Season Mode games are playable. 3 Dramatic Mode missions are available. 1st half of Exhibition Mode is playable. Successor of Baseball Superstars®, which has sold over 10M copies worldwide. 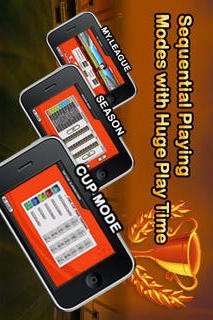 Manage your player or team through numerous seasons. Perform events, train or buy items for players to lead them to superstardom. 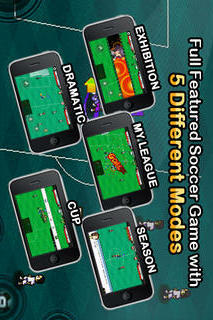 5 different modes; Exhibition, My League, Season, Cup and Dramatic Mode guarantee endless play time. 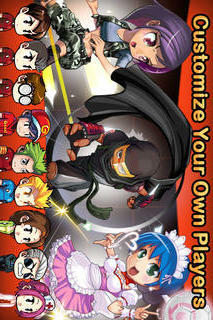 Enjoy the familiar RPG elements of the Superstars franchise! Customize name, physical features and apparels of your player. Experience the casual and fun side of the most popular sport on the planet!